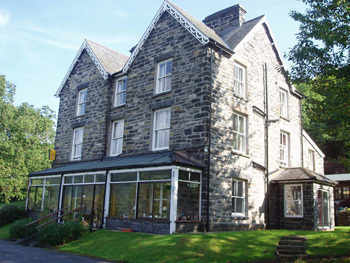 A fine Victorian building, traditionally built of local stone and slate in the 1860's, centrally located in the Snowdonia National Park, overlooking the beautiful village of Betws-y-Coed, with breathtakingly panoramic views. Nine recently refurbished en-suite rooms with modern facilities. A range of places to visit virtually on the doorstep; castles, forests, mines and museums, along with many country roads in and out of the village. 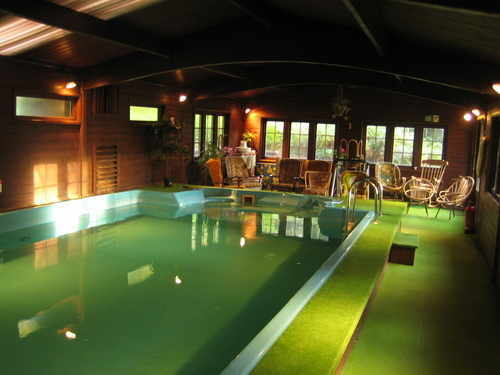 Have a swim whenever you wish in the heated indoor swimming pool, relax in the sauna... and then visit the bar afterwards! Your hosts, Jaap and Ghislaine, hope you will arrive as guests and leave as friends. Their aim is to make your stay as enjoyable as possible and state 'Our Home is Your Castle'. Over 250 teddy bears contribute to the homely and very informal entourage. Welsh, Dutch, German and French spoken. Free Wi-Fi. Motorcycle washing facilities and secluded private car park. Once an 18th Century coaching inn, full of historic character, in the pretty village of Dolwyddelan near to Betws-y-Coed and offering an unique place to stay in the heart of the Snowdonia National Park. Elen's Castle has a choice of rooms from a family/group suite for up to 6, to a twin room, various doubles with or without views, and for those wanting luxury and romance... there are four poster bedrooms, overlooking the Lledr Valley and river. The informal and friendly restaurant serves delicious, home-cooked food using local produce and the cosy, historic bar/lounge with log-burning stove is relaxing and well-stocked. Located at the foot of Mount Siabod and in the centre of the quaint village, which is overlooked by the 13th Century Dolwyddelan Castle. Places of visit include Blaenau Ffestiniog Steam Railway, Beddgelert and Portmeirion Village; Designed and constructed with a Mediterranean feel, which resemble an Italian town and has been used for a variety of film locations including the cult classic series; The Prisoner. Adam and Helen welcome you to their comfortable and friendly family-run hotel. Free Wi-Fi. Secure parking. Betws-y-Coed, Gwynedd, North Wales, Mid Wales, Snowdonia, of Betws-y-Coed, in its’ own grounds, overlooking the clear waters of the River Llugwy. Hotels, B&B, guest houses, cottages, hostels, camping. Ideal for touring! Biker friendly B&B, places where Bikers are welcome, , edge of Betws-y-Coed in the Snowdonia National Park, close enough to enjoy all of the village amenities and secluded enough to escape the crowds. Ideal for Snowdonia and North Wales, Swallow Falls, Gwydyr Castle, Bodnant Gardens, Llechwedd Slate Caverns and the Snowdon Mountain Railway.. Free Wi-Fi. Motorcycle washing facility. Private parking, not visible from road. Betws-y-Coed in the Snowdonia National Park, close enough to enjoy all of the village amenities and secluded enough to escape the crowds. Snowdonia and North Wales, Swallow Falls, Gwydyr Castle, Bodnant Gardens, Llechwedd Slate Caverns and the Snowdon Mountain Railway.